New music : Biz deal is finally done. This means songs are being fast tracked to being finished. (Mixing /mastering). Stay tuned for more details. I swear I’m pushing! People are betting on a Mapril release! Stunning photo for February. Thanks Al! short twitter party. Basically he said he’s not going to Oscars, is still in London, new music coming out in spring. Favorite outfit from all touring is black leather & gold jacket … says he was a lot leaner then (with crying emoji). song isnt a pop song written by me, it’s a hilarious character song written by the creators for Emperor Maximus in the film. These articles are just spreading the Variety hearsay mention. Theres’s been no official statement on Queen being asked or a refusal on their part. @mariana20501 Bohemian Rhapsody SHOCK: Queen ‘TURNS DOWN’ Oscars opening performance https://www.express.co.uk/entertainment/films/1081327/Bohemian-Rhapsody-Oscars-Queen-Brian-May-Roger-Taylor-Freddie-Mercury-Bryan-Singer @mickivick Replying to @bmoschetti and @vistadiva These articles are just spreading the Variety hearsay mention. Theres's been no official statement on Queen being asked or a refusal on their part. From Adam Lambert Fans – Official Adam Lambert Fan Club on Facebook. @Cecycat1 21h NEW ADDRESS FOR ADAM... Adam Lambert c/o Wonderful Union 1909 H Street Sacramento, CA 95811 From Adam Lambert Fans - Official Adam Lambert Fan Club on Facebook. Yeah this look made me happy. Lol. So how’s this for strange coincidences…caught up with the end of January’s Chat and saw the talk about Johnny Flynn playing David Bowie. Talked to my daughter who is in London and tells me she’s going to see a play tonight called True West. I look it up and who’s playing one of the main characters? You guessed it – JOHNNY FLYNN!!! And now I see that AL is in London!! Crazy 😜 or what?? So how's this for strange coincidences...caught up with the end of January's Chat and saw the talk about Johnny Flynn playing David Bowie. Talked to my daughter who is in London and tells me she's going to see a play tonight called True West. I look it up and who's playing one of the main characters? You guessed it - JOHNNY FLYNN!!! And now I see that AL is in London!! Crazy 😜 or what?? Have a wonderful day filled with love, joy, happiness and music of Adam’s. Happy Birthday, little dutchess!! Remembering our road trip to Wilkes Barre!! Say hi to the Duke for me!! Thanks for the birthday wishes, sistasif!! I appreciate that you thought of me!! Thanks for the birthday wishes, sistasif!! I appreciate that you thought of me!! When's your birthday? Hi sis! March, the same month as Sauli’s. The other night I dreamt that Adam went to Finland to tell Sauli to let him go. Find someone else and don’t wait for him. I woke up crying. The dream wasn’t out of the blue because that day I read from atop and someone said Adam was dating a young guy from Spain. That was prolly in my mind all day. There are many ALLers’ birthdays this month. Hubby’s bd as well. Valentines’ too. With virtual cakes and real cakes I’ll gain a lot of weight. AL, the photo up there is gorgeous. Thank you. And thanks ulti, luval, riskylady and other posters for keeping this place going on. Rain or shine, freeze or burn you’re always here esp. luval and ulti. I’m bad at posting now because I have discovered twitter. Every morning I check in here first and then get stuck in twitter world most of the time. By the time I come back here most of Adam’s news have been posted. I’ll have to wean from twitter. 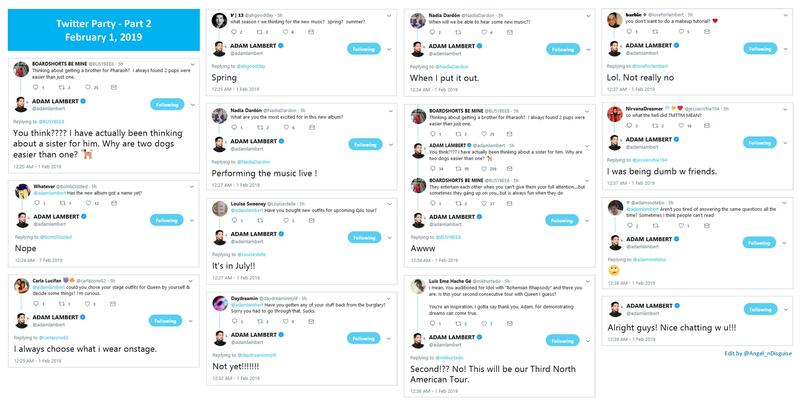 When Adam’s new music and QAL Tour come we will be busy again. 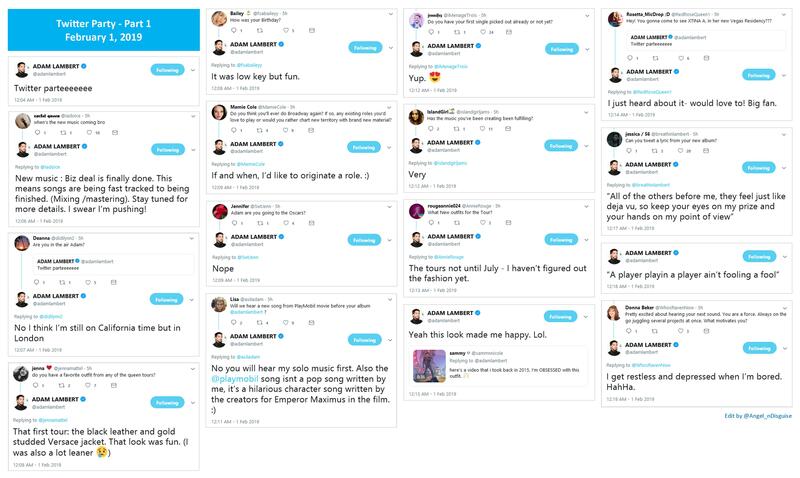 Rami Malek: "For anyone who is seeking any solace in all of this ...Bryan Singer was fired, I don't think that was something anyone saw coming but I think that had to happen and it did." There’s a sitcom on Fox called The Kool Kids which is about a group of friends at a retirement home. I tape it every Friday at 8:30pm. Last night’s show actress Vicki Lawrence was wearing a Queen tee pretty much the whole show. Looks like a 2014 one because of the logo then. There's a sitcom on Fox called The Kool Kids which is about a group of friends at a retirement home. I tape it every Friday at 8:30pm. Last night's show actress Vicki Lawrence was wearing a Queen tee pretty much the whole show. Looks like a 2014 one because of the logo then. was singing at the Kennedy center honors and asked myself the same question. I’m picky about music and have been listening to him ever since. He really is an amazing talent. Late to the show. 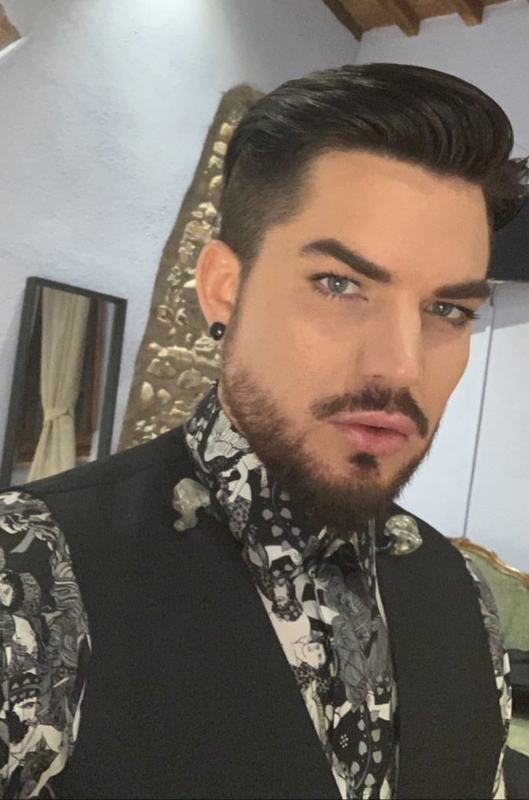 There's lots of them out there Mike Jones @jonesy2167 Replying to @aaron85stewart @Invisible_Ride and 2 others The first time I heard @adamlambert was singing at the Kennedy center honors and asked myself the same question. I’m picky about music and have been listening to him ever since. He really is an amazing talent. and can’t think of spending the day singing #Queen songs without my Freddie Mercury half mic! Can I carry this on the plane? It’s PVC pipe, no metal. Nice costume, Angie! While not on our prohibited items list, we recommend placing props made of pipes in your checked bag. The size or weight would determine if it’s considered an item that could be used as a bludgeon. My prop half mic is the least of their problems. Wait until they hear me sing! Angie Whitworth-Pace @AngieRunsSLC @AskTSA I am flying to Las Vegas to #RockLikeQueenTour and can't think of spending the day singing #Queen songs without my Freddie Mercury half mic! Can I carry this on the plane? It's PVC pipe, no metal. https://pbs.twimg.com/media/DyR3oLaVYAACQUr?format=jpg&name=900x900 The reply: AskTSA @AskTSA · Jan 31 Replying to @AngieRunsSLC Nice costume, Angie! While not on our prohibited items list, we recommend placing props made of pipes in your checked bag. The size or weight would determine if it's considered an item that could be used as a bludgeon. Angie Whitworth-Pace Angie Whitworth-Pace @AngieRunsSLC · Jan 31 My prop half mic is the least of their problems. Wait until they hear me sing! 😂 🎤Thanks! Once upon a time, I tried on a pair of leather pants. Tragedy ensued. @MichaelSlezakTV 22h Replying to @adamlambert Once upon a time, I tried on a pair of leather pants. Tragedy ensued. Sauli’s Instagram. Survivor Finland Selviytyjät Suomi starts tomorrow. Don’t Stop Them Now! Adam Wow’d my post! Here is Adam with that Elvis impersonator at the party. In these pictures he really doesn’t look like Elvis that much. So I guess they were never asked. NOPE ! We never turned down playing at the Oscars. We’re just happy and proud that Bohemian Rhapsody has received 5 nominations, and we will be there in support !!! I love it when it’s time to renew my license plate tabs, and I get to educate and spread the good word to the uninitiated poor lost souls who always ask what it means. It’s a public service I’m performing really. thanks asif and sparkle for the birthday wishes…the 1st of February kind of just creeps up. Thanks asif for remembering and sparkle I always think of that trip when we met…so much fun that weekend and the start of really meeting those with whom we shared so much re:Adam. The Duke says hi back at ya! thanks asif and sparkle for the birthday wishes...the 1st of February kind of just creeps up. Thanks asif for remembering and sparkle I always think of that trip when we met...so much fun that weekend and the start of really meeting those with whom we shared so much re:Adam. The Duke says hi back at ya! And Happy Birthday to you too! Seems there’s several of us all around the same time. And Happy Birthday to you too! Seems there's several of us all around the same time. We have that special Aquarian connection with our Adam and with each other – we are kindred spirits! We have that special Aquarian connection with our Adam and with each other - we are kindred spirits!